Non-harsh-oscillating-processing. For a relatively high gain silicon fuzz circuit this thing is smooth, like real smooth, a soft smooth you could say. Make no mistake this blue cyclops will fart-out a chewy smoke laden fuzz cloud you can really get your teeth into but will do so with a degree of etiquette. Bourbon as mouthwash holes punched through corrugated cardboard kinda tones but delivered to your ears with an air of refinement. No mad spazzed out oscillation and no frying eggs soundtracks going on in the background. In other words, it's a smartly designed circuit. Very simple, but thoroughly thought out. As cliched as it will sound it is a very germanium sounding silicon pedal. Not that silicon can't or doesn't sound warm or smooth but, to me at any rate, this degree of refinement adds much greatness to the whole idea of having a circuit so simple in design and function that sounds so well balanced. It'll easily trip on freaked out garage riffage all day long but happily chow down on the heavier 70's vibes. One knob, many flavours. The Fuzz Box's refinement also makes this a very interactive tool. It stacks well with other noise makers and gels beautifully with a heavily overdriven amplifier, no sag no control loss in the low end. Clean up, you are not going to get clean up from the volume control on your guitar but what you do get is tonal variation. What is there is musical and most definably usable. I'm going to build this tonight. I only have 2N5089, but they should still work. Yes they should work fine, bear in mind you'll have to turn the transistors 180 degrees to the orientation shown in the layout to keep the pinouts right with a 2N5089. Just wanted to know, what may cause oscillation with this circuit? Can the filter cap have something to do with this? (I used 47uf) I've built one before and it was noisy with buffered and true bypass effects. The only one it got along with was a Russian BMP. Still love the box and currently rebuilding to these specs. which schematic did you use? always helpful to know when building something unverified.. thanks! I did it from the Fuzz Central scheme. It should be good to go, it's basically a Meathead (or should I say the Meathead is basically a Colorsound One Knob Fuzz) so just a "YAFF". Simple build and it's great. Ised Axial NEC tantalum for 10µ and metal can 109B/108B. Pretty sick looking little thing. Just have BC108, not a single BC109.....any recomendation to replace the 109? maybe check the BC108's in order to find 2 with different gain and use the higher as Q2? Just use the BC108s. It's strange this one because usually you get the higher gain transistor in Q2, but it appears to be the other way around in this. Or at least both transistors have an upper gain limit in the datasheet of 800 hfe, but the BC108 starts at 110, the BC109 starts at 200. I haven't measure an original but that at least suggests that Q1 may be a higher gain device. Socket and experiment I'd say. Thanks. I'll try to build it this afternoon if possible (I'm on call and yesterday evening there was a new realease installation, so testing team is driving me crazy :P). Works fiiiiine, built between call & call. Monday I'll buy a BC109 to see if any diference appears, but sounds really nice with two BC108. Next step: fit it in a 1590A that I have here. On Monday I expect to begin finally with the Klon Centaur. Just put a BC109 as Q1. Slightly higher output and a little more sustain. With the Bc108 as Q1 the sustain was somehow gated at the end of very long notes, with the BC109, the fading is more natural. Sound and tone is 99% the same with the BC108 than with the BC109, but for a few cents the pedal is built as should (besides the sustain fading improvement). Just a question after taking a look at the original schematics. Don't you think that the power filtering 100uF cap is important? I'll try to find a place for it in order to check if any diference is perceived. The schematic I did it from didn't show any filter cap so I left it off. I know from previous experience that sometimes if you include a filter cap which shouldn't be there with some fuzz pedals, it totally tames down the fuzz. A few people have experienced that with Devi fuzzes, and found it sounded right after snipping the cap. So with fuzz pedals, unless I know the original definitely did have one, I'll leave it off. You can always solder one straight across the DC adapter if you need to add one later. Oh, what a crap! Not a fuzz any longer with the 100uF power filtering. That's right, I've seen several schematics with or without this cap. In my opinion: big NOOOOOOO!!! Maybe this afternoon i'll try some different values for the 82r resistor. Love this harsh and untamed little beast, but would prefer a softer fadin' / not gate at the end of the note. I think you're more likely to cure the gating by swapping for other transistors rather than changing the other components. Try something low gain and see if the response is the same. Replacing Q1 or Q2 with a 2N3904, (mainly Q1) you get a no gated / cut decay fuzz but..... the effect itself changes too much, looses the raging garage harsh sound that you get with the pair bc 108-109, and becomes a tamed fuzz. So i'll keep the original pair, and use this one for noisy music, and use my Fuzz Face for a classic fuzz sound. Got this built. Of the lot of 109s and 108s that I ordered, not one is below 300 hfe. I think maybe that is why the fuzz kind of splats out on the decay ( actually it sounds kinda cool in a way so I will keep this one as is for a little noise making ). Other than that I really like this fuzz. Yes, 2K2 for Q2 and 10K for Q1 if you want to tweak that too. Not sure, because I stil have not tried it, but for what I've been reading, the "gating" or decay splat as you say, is more related to the 82r resistor than to anything else. In some places even recommend to put a pot or trim in series with this resistor in order to get a less gated end of notes. Thanks. I'll consider that as well in the next build. How is this biasing done anyway? What values and where to look for? Or is it just trial and error? anyone else have problems with this thing "popping" when engaged? i added my pulldown res but still makes noise. wtf? also, Mark, can you amend this to have a variable gain control too? For a Fuzz control remove the 1K resistor. Add a 1K pot, lug 3 to Q2 emitter, lugs 1 and 2 to ground. Or lug 1 to ground, lug 2 to 22u cap+ with cap- to ground. Try both and see which you prefer, you can always put the pot and cap on a breadboard first and make the connections there. I have no 108s, can I use two 109s? Or is there a suitable sub for the 108? Thanks, Mark, very much appreciated. Just built, works like a charm even with 250k pot. Transistor gains 112/510. Does anyone know what collector voltages i should aim for on Q1 & Q2? I am sorry for asking such a basic thing but is this center negative or positive? These effects are always centre negative because that is the standard for effect pedals with very few exceptions. Do you means is this negative or positive ground? If so then it's negative and can be daisy chained with all your other more usual negative ground effects. Thanks for the link Thomas. It seems almost obscene to see £249 as the price below that gut shot. Hell yeah ! that's the word ! Anyway, what would be the differences with carbon resistors vs film resistors and orange drop capacitors vs others ? Is it a diode we can see on the right of the "vero" ? I've heard differences using different types of resistors but in all honesty the differences are more likely to be because the carbon types will deviate more from the marked value than metal film will. But sometimes those deviations are good, because maybe an effect will just hit that sweet spot with a 490K resistor in one position rather than a 470K one (for instance). As such I've got full sets of metal film, carbon film and carbon comp so if I ever feel the need to experiment I can take advantage of those drifted values to make a pedal perfect for me. I do think that there are some differences in capacitors though even if those too are subtle. The orange drop caps are just polyester or possibly polypropylene and I suspect in 9V effects most people would be hard pressed to hear differences between those and any other poly cap. Differences are more obvious to me when comparing caps with different dielectrics such as tantalum, ceramic, paper in oil etc. But those differences are never night and day IMO, I've never built an effect which I thought sounded great with one type of cap but crap with another, I may just have an slight preference for one over the other in a given circuit. So I wouldn't get too hung up over it if I were you, just get in a set of poly caps you can find for a good price and enjoy your builds (plus maybe a set of cheap ceramics for fuzzes :o). The diode looking thing is a polystyrene cap and is no doubt the 220p. Thanks a lot for this wise advices, i will post a word when this one is done. It's done, but i used BC108C and BC109C and it's not as warm as the demo. The tone knob on the guitar makes no effect on the sound. Is it because BC109C in Q1 makes to much gain as a first amp stage ? I will try BC109A in Q1 and both BC108C and BC108A in Q2 and see what i prefer. 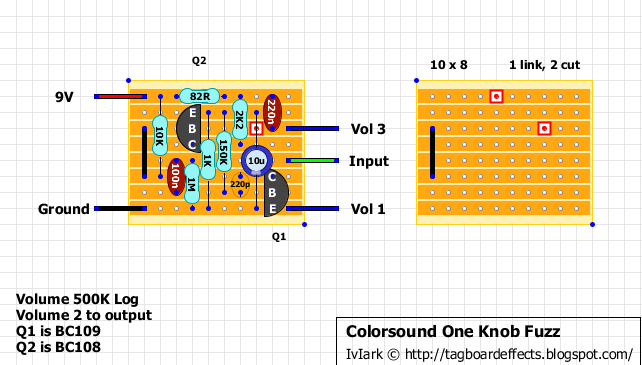 to add a bias resistor to this, would I just replace the 2k2 from Q2 C with a 5k-10k trimmer from Q2 C to ground? Thanks! or should i switch out the 10k fro Q1 C for a trimmer? Built this and used a 2n2222 for Q2 and a 2n8089 for Q1 after much experimenting. It really does need more gain in Q1. Boxed it for now with last month's LPB1 in front. Might sound better with a treble booster instead. Cheap Tonebender for an afternoon's work! Hi guys, i've got a problem with this pedal, i hope you can help me....In my pedal the knob works only in the middle position, if i turn it all the way down or up there is no sound....And it works like a volume of the fuzz not as a gain control....what can i do to fix this problem??? thaks!! Well. To begin with, the knob is for volume control so that is to be expected. Last time i had similar issues with a pot, it was because one of the lugs was touching the ground. So you should check all your connections to see that nothing is shorting. Built one of these last night. Reasonably nice, almost synthy and squelchy fuzz. I too have the gating at the end of notes but its not too bad and I'm yet to experiment with transistors much. As someone else here stated, 2n5089 and 2n222a are a good combo! Nice one for garage fuzz blast... Used a BC547B for Q1 and BC108 for Q2 - with a BC109 for Q1 the decay was pretty gated, with the BC547B it has smoother sustain with some crispy fizz at the end if the volume on the guitar is fully open. And thank you for this huge blog ! I just built the one knob fuzz and I've a little problem . I like the grain and thetone of it but the output level seems a little low for me, even with the pot at 80% . There's a volume drop when I engage the effect . Should I try a different pot value ? Or which resistor value should I change to have more output ? What transistors are you using? You could try to tweak the value of 2K2 to see if a bit higher value would give you more output. I'm using bc109 for q1 and bc108 for q2 . I also thought about tweaking the 2k2, I'll try tomorrow ! I solved my problem ! I tweaked the 2K2 and the 82R . I found a One knob fuzz Schematic where the 82R is in fact a 820R . So I replaced it with a 1k and the 2k2 with a 1k2 and it works great !! Maybe there is an error on the vero . Which resistor would I need to replace to add a tone control? you'll take the output from this effect and run it to the input of the tonestack. then the output from the tonestack becomes the new output. If you're happy with the bass response but want control over the high freq content, you could build the SWTC right onto the tone pot (just like your guitar) and take up no space in your box. By the way, I used BC109C instead of BC109 if that makes any difference... Any help would be very appreciated. i'll have to check mine to see the voltages of the transistors, but for some reason the collector current at Q2 seems off to me. the "C" at the end of BC109C is designating that when they were sorted they were in the higher gain range. so BC109A was in the lowest, and BC190B middle. it's the same for many of the BC model transistors. that could be throwing the bias off, but i doubt it. some suggestions to try right off the bat. first, run a knife between the tracks to make sure you don't have any bridges. sometimes there are teeny tiny ones that you can't really see that mess everything up. two, if it's not boxed in an enclosure yet, it can magnify oscillations that you won't get when it's boxed. can you post links to pictures of the board to and bottom? Thanks for your reply Zach! I've decided to re order the transistors and rebuild the whole board hoping that the issue won't persist. I did abad job at soldering so maybe not even knife can save it. Or maybe it is just bias issues. In any case, I'll report how the second attempt goes. If it still has the issue then I'll try tobox it to see if that changes anything. Thanks for your help anyway! Oh, forgot to ask... What hfe I should be looking to get from the resistors? This time I'll measure it before soldering them on. I mean transistors. What's wrong with me today! any time buddy. i think in mine i've got military motorola 2n2222a's which are in the 200's. it shouldn't be that much of an issue though. i was thinking though. the one pot is a volume pot, and with some builds that are high gain they will self oscillate through the pickups, by vibrating the strings on their own. one of the pedals i sell does that, mostly due to using really high gain transistors in something that typically uses lower gain transistors. it happens when the gain pot is around 3/4 and the volume high. I got a bunch of 108s and 109s today and measured them. The 108s are about 275hfe and 109s around 300hfe except one which measured at over 500. Thing is, when there is less signal from the guitar (ie guitar volume at 1 to 2) it squeels and I can actually control the pitch of it with the volume knob. But when there is no signal from the guitar at all it just gives me a really high pitched sine wave. I guess I should experiment with this on a breadboard first before putting on the vero. In any case, I'll try different things. I really loved the effect tone and all when it wasn't osculating so hopefully I'll get past this issue. Thanks again, Zach! So i just got the parts to actually put this together, and i just realized that i accidentally ordered a polarized .22 uF (220 nF) capacitor. Will this still work in the circuit? If so, how should i orient the leads on the strip board? Thank you. (Necroanswer) Negative to volume 3. That'll work just fine. Just built this one! Sounds great! Just one Q, when I roll off the knob, it kills the whole level of the effect. For example, I can roll off the knob until there is no sound. Is this normal? Or, should it roll off until it is back to your original guitar signal? If you're referring to volume knob, this is a feature. No signal when volume at zero. Should be perfect to start with. Simple build and great tone. Works great ! Perfect template for a A-sized mini-fuzz. Tried it first with 2xBC108B, and there whas that nasty high-frequency "squilch" when the notes died out. Changed them with 2N5089s, same thing ! After having gone through a whole session of comparisons, my heart went for a couple of H2N3904s. It goes to show how some trannies will sound great in some builds and not at all in others... And how rewarding it is to go through a bit of trial-and-error ! Switching to those transistors fixed the squealing when the notes die out? Would anybody know why this pedal would be picking up radio signals and buzzing? The effect works and passes signals. Always love hearing about these as it never happened to me! From what I know, you should use shielded wire for input and ground one side of it (maybe even go as far as doing the same for output) and maybe use the "star ground" wiring. Must be a ground/earth issue somewhere (not necessarily your pedal!). Try using a battery first maybe. I have another fuzz pedal that uses 3 BC109's that picks up radio when the gain and volume is up, I suspect that might be the problem. Can you recommend a good substitute? It can't be the transistors, no matter what. Pedal amplifies the signal, and to receive radio you'll need small capacitance, most likely between the wires of the incoming cable. I've seen a lot of those cheap patch cables to grab radio signal. Weak/bad standard guitar cables or even guitar's bad volume pot can do that too. I'd say it's way more likely to be coming from a cable than anything else. I have a weird problem with this effect. When it's in the box, the effect squeels when you roll off your volume, or tone pot on the guitar. When i have it outside the box, it's alright. What might the problem be? The weird thing is, when i boxed it, it was alright. About a month or so later this issue came up. Well, i just build a new board with a 47 uF between 9v and ground. Put it in the box and the problem is gone. I have no idea what went wrong, but it's working now. I'd suggest to triple check your power supply. If added power filtering cap made the issue go away, then there's a quite high chance of your power supply being bad. And the squeeling is back.. 5 months after fixing it. I guess it wasn't the power. Made mine with BS170 & 2N3904 and it sounds awesome! I really like this one ! Super simple and great fuzz !